Hand-embroidered Coat of Arms in brilliant colours and authentic heraldic detail. 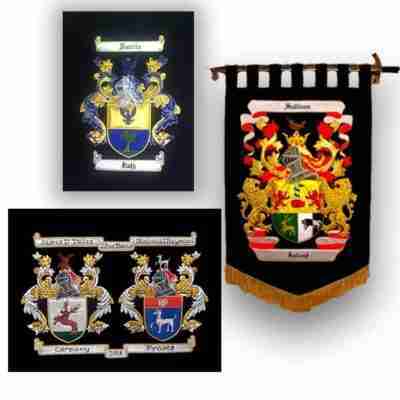 Family Crest Embroidery, your very own hand-embroidered Family Crest and Coat of Arms are available framed or unframed, reading for hanging on the wall in pride of place. team it up with the family Name History Certificate, and you have a family heirloom ready for the generations to come. These beautiful works of art are individually embroidered by hand, to order. The bespoke Family Crest Embroidery has a painstaking attention to detail, the artist captures the full glory of the Coat of Arms using a complete armorial colour palette of threads, which includes gold and silver bullion wire and thread. 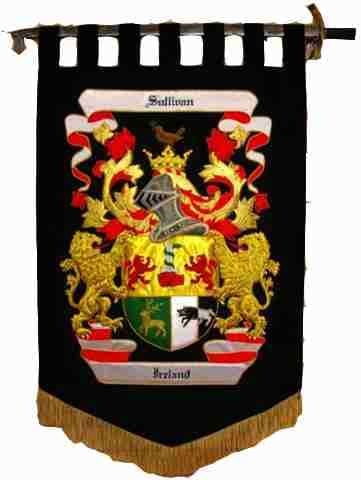 These hand-embroidered Family Crests and Coat of Arms are produced by specially trained artists, who are experts in heraldic and masonic regalia. Their knowledge of depicting the emblems of heraldry are exact as the language that was first employed centuries ago. This proud tradition lives on in the vibrant colours and detailed images in every embroidered family crest and coat of arms. 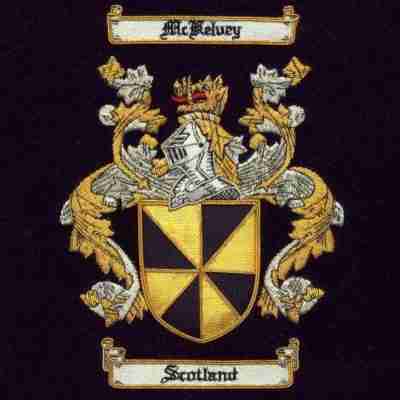 All Embroidered Family Crests and Coat of Arms are authentic in every detail.